Hey DoW, I think you'd actually get a lot more out of the Black Heart Kabal in the early goings. With the small number of transports, the Innured to Suffering bonus from Black Heart that gets conferred on to vehicles would do a lot to protect them after Invuln. saves. Plus you'd have plenty of CP's to play Agents of Vect and a good deal more afterwards. Agents of Vect is probably the most powerful stratagem in the game. Personally I think to get real return on Obsidian Rose when you run 5-6 Dissie Ravagers, and lots and lots Blasters in Venoms (getting more range on the Venoms is big). Thats just me though. If you have a plan and a playstyle that you think is working for you, I wouldn't listen to too much outside advice. Its usually best to just keeping riding out your theories. Anyway good luck bud let us know how you do in games! I see where you're coming from with the Black Heart kabal now. I didn't notice the FNP buff for transports before. While not groundbreaking, it is in no way insignificant. So I'll see the power from pain increase for my warriors and archons and my transports will gain FNP. Who would you take as warlord in this list? My thoughts would be Drazhar, which would gain him some much needed rerolls. I could also tweak the list and where the hqs are situated moving Drazhar to the outrider detachment and give the succubus a patrol changing warriors for wyches. That will give two archon and warrior patrols and one succubus and wych patrol. I don't have the wyches right now, but that new start collecting box seems to be calling to me. I'd probably steer clear of giving Drahzar warlord as Incubi are always big time targets. I think the Succubus with a the Red Grief Warlord trait to buff her Invuln would be a good call. But thats just me... either way let me know how you do in games I'm fascinated to see how everybody is doing! Cool. Thanks for the heads up. Just got the book last night, haven't got to go through it much yet, but oh boy! Well I was supposed to get another game in on Saturday, but Mother Nature had other plans, as we get slammed with a pretty major ice storm. Oh well, gave me time to work on the hobby side of things. Built another blaster warrior and four new sybarites. Since I'm going to try running multiple 5 man units and I wanted to keep the costs down, I needed some new models that had the bare kit, but I needed them distinctive enough from the regular warriors. I also went on a little spending spree and got myself some new hqs. Hoping to take the haemoculus in a spearhead detachment with three talos. Thought I'd give him the hex rifle to keep him in the same range as the taloi splinter cannons. It seemed the only logical option as everything else didn't have the threat range and I liked the idea of putting pressure on an opponents characters, even if it is very minor, I think the psychological effect is worth the few points it costs. I think even the sight of 3 Talos rumbling towards my battle lines would freak out a lot of players, especially given how much cheaper they are with the Codex. Could work out to be a very cool little detachment! Nice! Great modeling on all those units DoW. The Archon in particular looks awesome! I thought I'd seen every conversion possible of that dude, but this one is by far one of my faves. I love how he's looking into the wind... and the sword arm looks great too. Great job. Sorry about your game falling through because of ice. I'm on the east coast too so I know its been rough weather for sure. Anyway great stuff DoW keep it up you are on a roll! Isn't kit bashing so much fun?! It's so great now that GW gives us so many extras so we can put personality into so much now and you have done just that. 2 thumbs up, now get them painted . @Looshkin they are certainly going to be scary especially since I just ordered 3 sets of haywire blasters that I'm going to get them magnetized with. Look out vehicles, here I come. @Cavalier Thanks for the kind words on the archon. I really love those domed reaver heads. 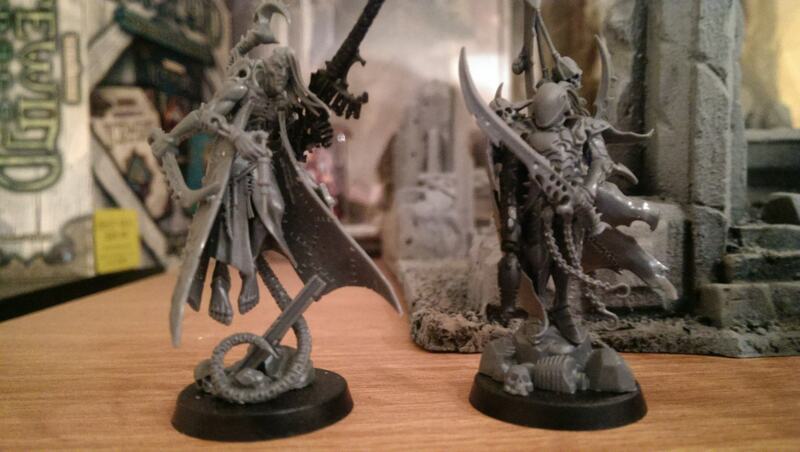 @Dread Kit bashing dark eldar is so much fun. Especially with all the extra bits they come with now. So I've been busy painting up my scourges, as I wanted to get those done before I started on my characters. Blaster scourges are up first. Pretty much have all the armour done and highlighted and everything else basecoated and ready to wash and highlight. The wing patterns that I'm going to paint I'll leave as a surprise for my next post. After these guys, I was planning on tackling my shredder scourges, but that archon is really begging for some paint. Scourges are easily some of my favourite models (Swooping Hawks are, of course also in the list!! ), so I'm excited to see what you do with these guys. You're off to a great start! Oh! *claps hands* ready now go. Off to a good start for sure. What's gonna be the wings base colors? Absolutley rocking DoW! Love the color you chose for the wings, truly eye catching! Good call on the Blasters, but super stoked to hear you are gonna rock shredders! Get ready to surprise some people man, because I've heard they are nasty. Make sure you keep us posted on games man I'm super stoked to hear about how you get on with the new dex. @Cav thanks buddy. I was super excited about the shredders too, as I've always viewed them as then red headed step child of the dark eldar armaments and I've always wanted them to work. I've also caved and bought enough haywire blasters from a bits site to make a third unit. @Dread the base colour is a warm white which you can see in the picture, but with my terrible photography skills it just looks like primer for now. 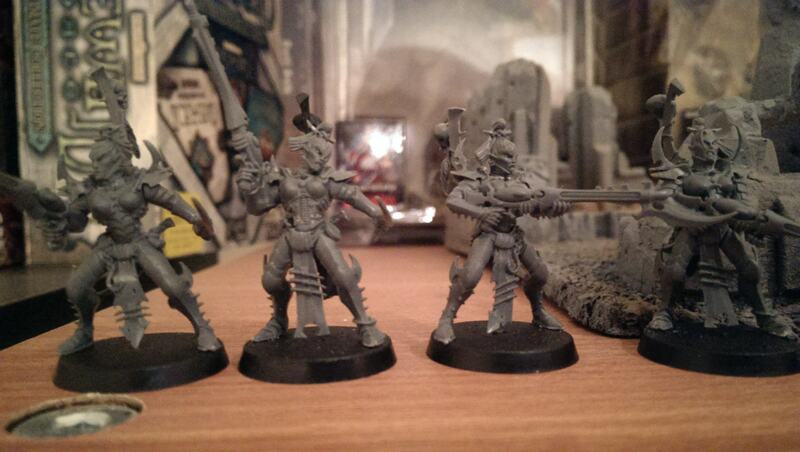 @Loosh these guys have always been my favourite models too, well before I even thought about playing Sark eldar. I love their dynamic poses and giant wings. They are just terrible to play with on the tabletop because of that though. I guess the most beautiful models are almost always the ones that never stand up right or have little fiddly bits that break off all the time. 40k never really pairs form and function very well I guess. Not an original idea, as I've mimicked something I saw online, but when is anything original anymore. Hope you like them. There's still a little cleanup to do. I was thinking of washing the wings to bring out the lines in the feathers more, but I was worried it would make them too dark. I may experiment if I'm feeling risky or more likely next time I'm a little tipsy. Nice DoW. I think the colors work really nicely. 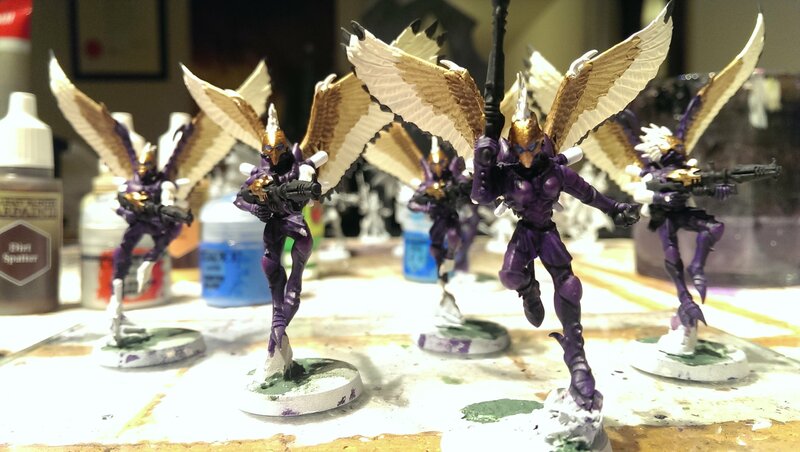 I’d probably hit the wings with a Seraphim Sepia shade to get the depths and texture and then follow up with a dry brush of the original colors to ensure you get that initial pop back again. Looking terrific though mate, keep it up! Hey DoW. They look great man. Really dig the natural colors on the wings. They look freaking great. But yeah I agree with Loosh 100% hit those bad boys with a little Seraphim Sepia. Its a nice light wash but it'll give great definition and shading, really taking them to the next level. I love how you are gonna be rocking so many Scourge, thats really cool. Could be some cool backstory there. Anyway great stuff man love it! 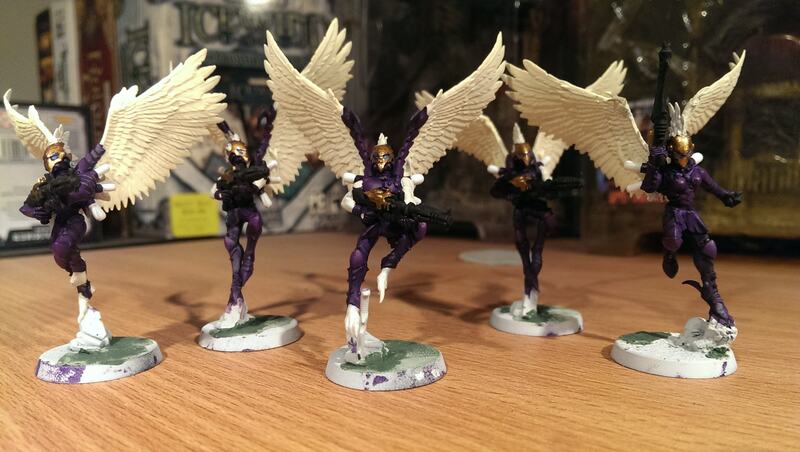 I'm a fan of the eagle wings on the Scourges, but I do agree a nice wash could elevate these dudes to another level. Favorite models I've seen yet are the Incubi and their commander, even with Drazar's model age, he still looks good the way you painted him! He still looks like he belongs with those shiny new Incubi (well, I guess that are not really shiny-new anymore, but you know what I mean ).